Though there have been three iterations of the iconic vehicle used to ferry players and cheerleaders around campus, the most recent Bucky Wagon is a 1932 LaFrance fire engine donated by Jay J. and Norma Normington in 1971. 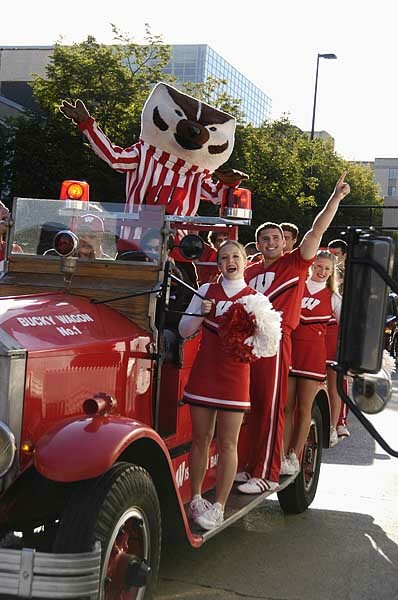 It was used primarily to carry the Spirit Squad into Camp Randall on game day, until the UW Athletic Department deemed the wagon unsafe in 2001–weak running boards couldn’t support squad members, and the wagon was notoriously hard to control, thanks to ancient cable brakes and the absence of power steering. That, and the athletic department didn’t appreciate the oil spot it left on the field. By 2009, the Bucky Wagon sat in a campus garage with a cracked transmission, unable to be repaired as parts for the wagon became impossible to find. That’s when UW-Madison mechanical engineering faculty associate Glenn Bower stepped in, turning the ailing campus institution into a new project that would require the coordination of donors and alumni in the private sector with members of the College of Engineering student vehicle teams. The objective? To turn put an all-electric motor into the old fire engine, and to restore its exterior to preserve the Bucky Wagon tradition for years to come. The wagon has come a long way in those two years. Seniors in a mechanical engineering powertrain design course calculated all the specifications for new axles, which were handed off to Mark Polster, a UW-Madison alum at Ford Motor Company who convinced it to manufacture the axles and donate them to the project. Hydraulic brakes and power steering were added. Remy International, Inc. donated an all-electric motor, and Phoenix International Corporation donated a controller to communicate between the motor, the controls and the battery systems. An enormous lithium ion battery pack donated by A123 Systems would provide power the engine, and ZF Transmissions donated a manual transmission yanked out of a heavy-duty truck and re-calibrated to transfer power to the rear wheels. But only as the wagon closes in on its debut to the public at the 2011 homecoming celebration has everything come together to restore the wagon’s appearance to match its revamped inner workings. This summer, the rusted-together exterior was disassembled piece-by-piece by MATC students, and Eau Claire-based Envirotech sand-blasted and powder-coated the frame to prevent future issues with rust. New aluminum rims from Alcoa were donated for the final wagon. Finally, Pierce Manufacturing took the wagon into one of their production facilities in Appleton to re-assemble the entire body. They’re salvaging what they can of the old wagon–base parts of the body, the old headlights, and of course, the classic siren–but they’re designing new pieces to replace the parts that didn’t hold up over the years. Among other tweaks to the design, the running boards will now withstand the weight of as many Spirit Squad members as can fit on the sides, and the wagon now has built-in storage for all of Bucky’s gear. The Bucky Wagon is nearly 80 years old, but soon enough, it will roll through another homecoming parade as though fresh off the assembly line, ready to become a campus icon in the minds of another whole generation of UW students and alumni. Stay tuned to hear more about how the new wagon will join this year’s homecoming celebrations! Wow! Aren’t UW-Madison engineering faculty/students ingenious! Thanks! We all look forward to seeing the Bucky Wagon again — keep the tradition!! !